Direct Oceanfront 1 Bedroom- Unit 206 HAWAIIAN INN!! The Hawaiian Inn is a hidden jewel of Daytona Beach. The Hawaiian Inn has been pleasing travelers to the "The World's Most Famous Beach" for over 50 years. The Hawaiian Inn is a place where you can rejoice in a breathtaking sunrise, be enchanted by the moon set on the water, take a stroll or run down the beach or just relax in a lounge chair and gaze at the waves of the Atlantic Ocean. You can savor the island atmosphere as you relax by the Olympic-size pool listening to the DJ or saxophone player play your favorite island tunes. Relish the ocean breezes in the hammocks while sipping exotic tropical drinks and gazing out at the endless expanse of the Atlantic Ocean; get a bite to eat at the pool side Tiki Bar, or play a round of putt-putt golf with a friend. Enjoy beautiful ocean views from this professionally decorated unit located on the second floor. The unit has been completely upgraded with solid wood cabinets, granite countertops. No shortage for storage with a full pantry for all your goodies. This direct oceanfront one-bedroom unit provides a separate bedroom with two queen -sized beds. The spacious living room is furnished with leather queen sleeper sofa, recliner and 40" flat screen TV. The furnished balcony looks directly out to the Atlantic Ocean. Amenities for this unit include a fully equipped kitchen, two flat screen cable TVs, air conditioning, stereo CD player, linens, towels, beach chairs, umbrella, beach towels, skim boards, and boogie boards. Lifetime Resident of Florida. I have enjoyed the beaches of Florida my entire life. I LOVE Daytona Beach ....it is " The World's Most Famous Beach". 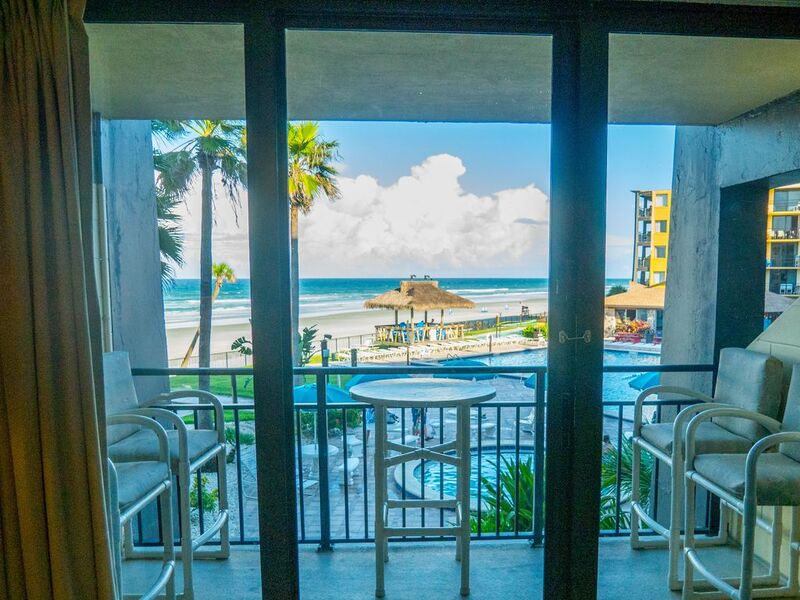 We are very proud of the condos we own and rent at Hawaiian Inn, Daytona Beach, FL. These are not just investment properties; they are personal vacation condos. We enjoy these condos along with our guests! Our family has been visiting Hawaiian Inn for over 30 years. Our children grew up enjoying the kidding pool, hammock area, indoor pool, arcade area, hoola hooping to music on the pool deck, hamburgers and pizza from Tiki Grill, swimming and jumping in the oversized Olympic pool and playing for hours in the beautiful surf of the Atlantic Ocean. We own 3 units at the Hawaiian Inn and we constantly updated our units, Unit 206, 515 & 215 have been completely upgraded with new furnishings, granite kitchen counters, new appliances, flooring and upgraded bathrooms. We have spent thousands of dollars to furnish and fill our condos with anything possible to make your stay enjoyable including beach chairs, beach umbrella and beach towels. Just bring you suitcase and your smile! Make the right decision, rent directly from owners who care about their property.. You will not only save money you will get the BEST condo in the Hawaiian Inn. Go with a Sand Castle Beach Rentals vacation condo. 9 holes Oceanside putt putt available to all guests. Loved the view and access to the beach. Close to all ammenities. Overall building has seen better days however the unit itself had many nice upgrades. Front door opening and closing was cumbersome as was the patio door which needs a screen to allow the beautiful breezes to come thru. Some of the electric outlets were loose and the fan in the bedroom was a bit noisy. We are just getting ready to depart after a wonderful week at Daytona Beach. The best part? The view from this amazing condo. The condo itself is great. It's clean. It's modern. The furniture is comfortable. Even the pull out bed in the living room is the best one I've ever slept on. The kitchen is well stocked. (Bring coffee for a drip brewer. Filters were in the cupboard.) But...THE VIEW! Wow! A wall of windows faces the ocean and catches the morning sun. The balcony has a table and four chairs. This is where you will want to spend your time! As I sit here and watch the sun come up over the ocean for the last day of our visit, I am so grateful for having this lovely vacation condo to stay in. Thank you so much Jay for the wonderful review! Come back soon! The condo was perfect for a girls get-away. View was beautiful. We had everything we needed here. It was close to fine dining, grocery store and was equipped with the essentials, clean and comfortable. This unit is in one of Daytona’s heyday hotels. From the street, it looks like it’s past its prime. Once you’re in the unit, you forget all that. The unit is simply but thoughtfully decorated. It has anything you would need — except coffee, so arrive with enough for one morning, or early enough in the day to get some. The beds are comfortable; the kitchen and bath are updated. Best of all, the view is spectacular and the patio high top is perfect. The pool area is huge and well-kept, and is part of the great view. The only weak point is low water pressure, but that’s so minor that it doesn’t matter. This is a lovely unit and we hope to stay here again. We got some great sunrise pics! Rates are subject to change until reservation is confirmed. Guest must be over the age of 25 years of age.